Of 1,607 parents eligible to be reunited with their children, 719 have final orders of deportation, the government says, meaning they could be removed from the country as soon as they are reunited. The Trump administration said in a court filing late Thursday that it has reunified 364 of more than 2,500 migrant children separated from their parents at the U.S. southern border, just one week out from a court-ordered deadline. Of 1,607 parents eligible to be reunited with their children, the filing said, 719 have final orders of deportation, meaning they could be removed from the country as soon as they are reunited. Those parents may have to choose between bringing their child back to a violent country or leaving them behind in the care of the government, nonprofits, foster families or relatives in order to seek asylum in the United States. Toczylowski said the number was “way higher than I thought,” and said attorneys would need to immediately make contact with reunited families to advise them on potential legal avenues to stay in the United States. Many of the parents were forcibly separated from their children under a tough immigration policy announced by Attorney General Jeff Sessions in May. The so-called zero tolerance policy required officials to immediately prosecute people who crossed the border illegally, thereby separating children from parents sent into custody. Judge Dana Sabraw of the Southern District of California, who is presiding over a lawsuit brought by separated parents seeking to reunify with their children, earlier this week ordered a temporary hold on deportations of reunited families. The order was in response to a request by the American Civil Liberties Union arguing that lawyers were not able to provide legal counsel to families before they were forced to make such a difficult decision. In some cases, the parent may still have a pending asylum claim, immigration lawyers have said. 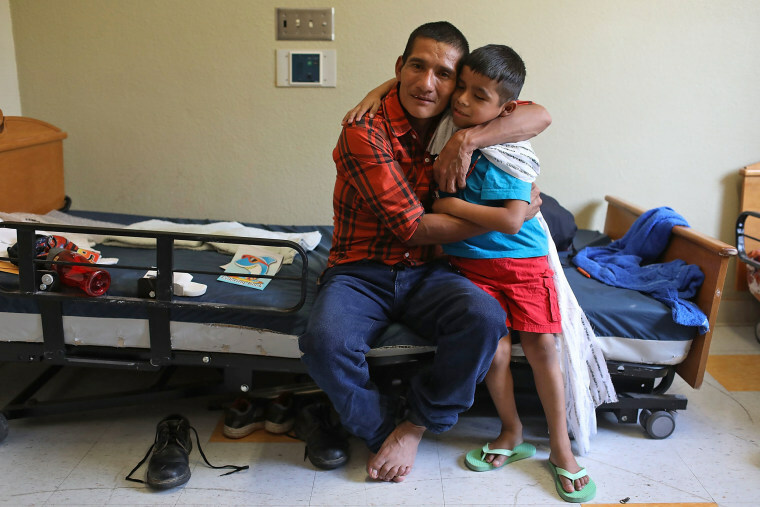 Attorneys for the Justice Department also said in the filing that 1,607 parents are eligible for reunification, while 908 are not expected to be eligible because of criminal backgrounds or, in the majority of cases, because the parent required "further evaluation." Department of Homeland Security Secretary Kirstjen Nielsen said on Thursday that her agency would do its best to meet the July 26 deadline for reunifications but would "not cut corners" on vetting parents. "Again this is about the protection of the child," Nielsen told NBC News National Correspondent Peter Alexander at the Aspen National Security Forum. Lawyers for the ACLU representing parents who were separated from their children said in the joint filing to Sabraw’s court that the government still has not provided the names of parents who have been deported or released from ICE detention. The ACLU says that information is critical to ensure those parents have legal representation as they seek to reunify. "Plaintiffs do not know where and when any of these families will be reunited," the ACLU said. The government said in the filing it would provide information on deported and released parents in the coming days.